It is my belief that most professional baseball announcers wish they could be professional baseball players. Maybe that’s because I wish I could be a professional baseball player. 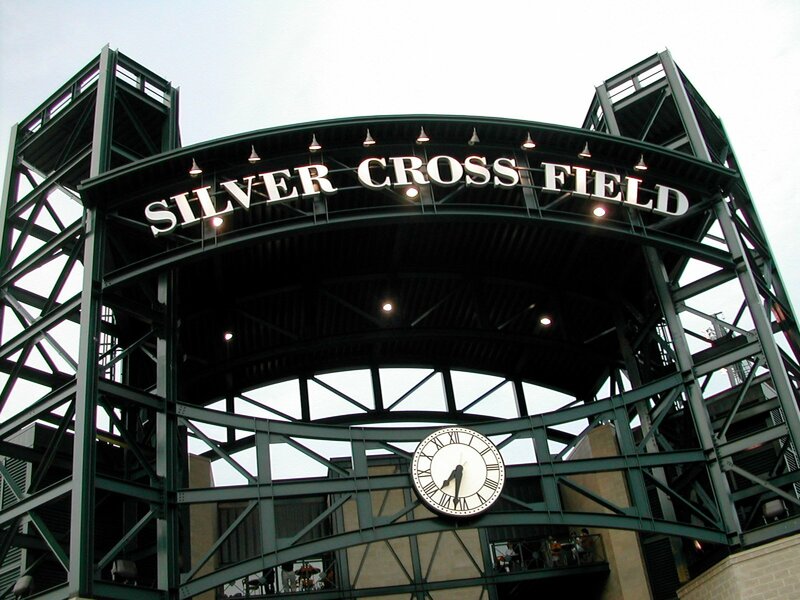 Growing up in Seattle, WA, I dreamed of starring for the Seattle Mariners. Around age 11, I realized this was not going to happen. I was placed in “minors” in Little League for the second straight year. If you can’t make the “majors” in Little League, you’re probably not making the Majors with a capital M.
It was at this point I started thinking about the movie “The Sandlot.” This film came out the year I was in Kindergarten and remains one of my favorite movies to this day. Scott Smalls, the narrator, was lousy at baseball, so eventually he became an announcer. Now I was much better than Smalls (and for crying out loud I’ve always known about The Great Bambino) but the general idea was very appealing. So after my second straight Little League rejection, I set my sights on one day making it to the broadcast booth. I’d already been broadcasting pretend baseball games in my driveway since I was three, so this wasn’t a radical change of direction in my life plans. 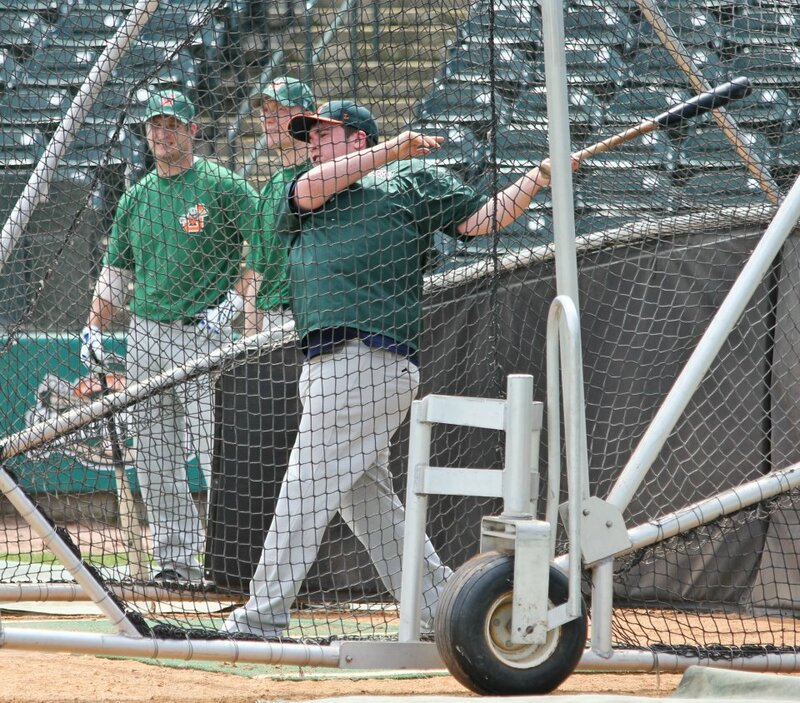 Fast-forward to 2012 and I’m the voice of the Joliet Slammers professional baseball team. It’s not the Majors yet, but I’m being paid to broadcast professional baseball games at the age of 24, so that’s a plus. My plan was to use the off-season to get in shape. This didn’t happen. See, the off-season in professional baseball is actually more stressful than the season. During the season I get to broadcast baseball. During the off-season, my hours are more normal but I spend the entire time trying to find corporate sponsors. No one has ever gotten in playing shape while cold calling. By the time I got home, I’d be tired from work and I’d go to sleep. Working out just didn’t happen. So I was the same chubby kid I’ve been since the sixth grade when I stepped on the field in early May for the first day of Spring Training. Before we went out there, I was privy to 2011 Frontier League Manager of the Year Bart Zeller’s pre-season welcome speech to the 2012 Slammers. One of the key components of the speech was “what happens in the locker room, stays in the locker room,” so sorry, I’m not going to reveal what was said. However, I can tell you that Zeller emphasized to the entire team that a key component of them sticking around was that they must be model citizens in the community. I was introduced to the team and the coaching staff explained that I’d be working out with them for a few days. I’d put on the catchers gear and caught our star relief pitcher Brian Smith the other day with our best hitter Erik Lis at the plate so they knew I wasn’t a complete clown on the baseball field. I eagerly jogged out to the field to get my first day as a professional baseball player started. I’d bought cleats, baseball socks and other necessary gear the day before at a used sporting goods store, so I was ready. “No way,” I said. I’ve seen “The Sandlot”, remember? I should have taken the fact I was exhausted after the warm-ups were over as a hint. Running back and forth, frontwards, backwards, sideways, upside down (okay, not upside down) takes a lot out of a man. Bart started yelling at me during the stretches because apparently I wasn’t doing them correctly. Now, I don’t have many muscles to stretch, but I digress. Stretching was never something I paid much attention to since I’d never gotten hurt playing a sport. This is probably due to the fact I don’t move quickly enough to get hurt. I was still winded as I began playing catch with Kyle Maunus. This is one area of baseball where I thrive. If you need a guy to play catch at the highest level, I’m your man. So no one yelled at me that I wasn’t throwing or catching the ball properly. Next up on the first day of practice was good old infield and outfield work. I joined Lis and Maunus over at first base. I started playing first base at the age of 12 because (a) I couldn’t move very quickly and (b) there is no other reason. Once again, I held my own. Professional baseball players throw the ball a lot harder to first than my buddies did back in high school, but at the same time they are a lot more accurate. I think only one throw went over my head which is impressive considering I am 5”10” with spikes. By comparison, Maunus is 6’4’’. Bart doesn’t know this but I nearly took off his head on a throw home once during infield/outfield. Luckily one of the catchers saved him from being hit and thus he is still our manager today. Nonetheless, infield practice went very well for me. This is where I can hang with pros. This entire time I am sure the players were watching me with bemusement but frankly I didn’t notice. When I get involved with a sport, I may not be very good at it, but it consumes my focus. In Little League, I was not the kid picking dandelions in the outfield. I was the kid who screamed angrily at that kid for picking dandelions or for making an error. My competitiveness has always outweighed my talent by an unhealthy margin. (Seriously, watch me bowl some time, it’s not pretty). After infield/outfield, it was time for batting practice! I love batting practice. Batting practice is usually the one time I can pretend I’m a good hitter. A 90 mph fastball (heck an 80 mph fastball) is insanely hard for me to hit and I’m helpless against any sort of junk. But in BP, it’s straight, down the middle, with no movement. The day was not a cold one. It had started overcast but by the time BP rolled around it was over 80 degrees out on the field. So my second wind after I felt tired from the warm-ups was almost over. I was in group three so for the first two rounds I shagged balls in the outfield and watched one of our pitchers nearly pull a Mariano Rivera at the right field wall. One of the players asked me what I do in the off-season. I explained cold calling. He lost interest. Finally, it was time to hit. Hitting is something I can actually be fairly effective at if given a few weeks to get my swing going. Unfortunately, this was one day and I was already tired. I stepped in to the batter’s box and a lot of grounders to short followed. Words that will never be heard on the radio were said by me as I grew increasingly frustrated. Nonetheless, after it was over, relief pitcher Chuck Lukanen told me he was impressed with my hitting and fielding. That made my day. Holding my own with the pros was the entire goal of this exercise. I’d stop reading if you have a queasy stomach. The next part of practice was what I like to call torture. Others call it conditioning. Conditioning started with something known as an “Indian Run.” Is this politically correct? I’m not sure. But that’s what it’s called. The entire team gets in a line and jogs around the field. The person in the back of the line has to sprint to the front. This goes on and on until the coaching staff decides the cruel and unusual punishment, I mean, exercise, can end. I can’t run to save my life when I’m not tired. “Yeah, this isn’t ending well,” I thought to myself as I sprinted to the front of the line. Hector Pellot told me they’d probably be doing this for 40 minutes. I don’t think I’ve ever been more terrified. Near the end of the first lap, both my legs started cramping up at once. Have you ever had both your legs cramp up at once? The pain is comparable to a thousand paper cuts at once. I persevered and once we got to center field it was my turn to sprint to the front of the line again. “Still want to be a professional baseball player?” pitcher Geoff Brown asked me as I stumbled by. I finally got to the front of the line but as we made the turn towards home I begin to not only have cramps in my legs but…well…my throat and stomach started to feel a little weird. Pellot finally lost patience with me and passed me to go down the home stretch. At that point, let’s just say I left it all on the field. I sat at my desk pondering how I could survive day two when our team president Bill Waliewski called me into his office along with VP of Baseball Operations Ron Biga. “Sorry kid, for your own safety, this is it,” Ron responded. My day as a professional baseball player was over. I was the first casualty of Spring Training. One day, the final regular season game of the baseball season: September 28, 2011, will go down as the day baseball finally emerged from the Steroids Era. It featured four teams battling for two playoff spots and dramatic finishes that will be remembered for years to come. The National League Wild Card battle was only the opening act. The Cardinals took care of business against the Astros but the Braves were three outs away from securing a one-game playoff with one of the top closers in the National League in Craig Kimbrel on the mound. He couldn’t get the job done as he walked three batters and surrendered a sacrifice fly as the Phillies tied the game. The Phillies would go on to win in 13 innings thanks a bloop single from Hunter Pence. But the American League was where the real drama was Wednesday night. One of the preeminent franchises in the game, the Boston Red Sox, and the little engine that could: the Tampa Bay Rays, were tied entering tonight’s action for the final AL playoff spot. First the Rays were one strike away from losing their game to the Yankees. But Dan Johnson, a career 3.3 WAR player who was below replacement level for the Rays in 2011 was at the plate. Of course he homered to tie the game. Did I mention the Rays were down 7-0 at one point? We’ll get there, I promise you. Then the Red Sox were one strike away from winning their game against the Orioles. And Nolan Reimold, a player I admittedly had never heard of and a career 2.3 WAR player was at the plate. He was facing Boston closer Jonathan Papelbon, who looked untouchable until he gave up a two-out double to Chris Davis. But still, the right-handed Reimold looked overmatched. Of course he doubled to right-center to tie the game. And of course Robert Andino, a career 1.9 WAR player, delivered the game-winning hit. It was a low liner to left that Carl Crawford could not catch despite a sliding attempt. His throw home was poor and the Orioles celebrated like they were going to the playoffs. Of course they weren’t, the Rays were. Only three minutes later, Evan Longoria moved closer to legend status with a walk-off home run down the left field line in the 12th inning to win it for Tampa. It was Longoria, one of baseball’s brightest post-Steroids Era stars, who delivered the initial body punch in the eighth when the Rays stunned the Yankees with six runs. Longoria’s three-run home run that inning pulled Tampa to within one after having been down 7-0 and seemingly doomed to start the inning. What made this night amusing for me was seeing the Yankees, bitter rivals of the Red Sox, playing their scrubs. The Yankees had already clinched the East Division so instead of Robertson and Rivera it was the likes of Ayala and Proctor that Tampa had to deal with. It didn’t make the night any less dramatic, just slightly humorous. Baseball has taken a beating in the national press ever since 1994. The strike killed many people’s interest in the game that season. It was revived during the Steroids Era due to the prominence of the home run, culminating in the epic 1998 clash between Mark McGwire and Sammy Sosa that resulted in McGwire hitting an unfathomable 70 homers in one season. But as the internet took over the country at the end of the 20th century, attention spans started to go down and Barry Bonds made a mockery of competitive fairness with his 2001 season. The revelation that all those home runs were produced not from smaller ballparks or a juiced ball, but from juiced players, once again killed many people’s interest in the game. Football has taken over as the king of American sports. Baseball has responded with more statistics, each one more advanced than the rest. But the beauty of Wednesday night was that it was one of those classic cases where the stats go out the window. Dan Johnson, Nolan Reimold, Robert Andino. Are you kidding me? It was the culmination of epic collapses from both the Braves and the Red Sox, but it was more than that. Baseball has seen epic collapses before but it hasn’t seen a night like this in many a year. Tampa Bay is a wonderful story. In a game that is often dominated by the Yankees and Red Sox, the Rays have made the AL East one of the most compelling divisions in the game the past few years. They only started playing baseball in 1998 in Tampa, and for years they were complete jokes. Their World Series run a few years ago ended those jokes and Wednesday night saw them capture the imagination of the country. Wednesday night was the night baseball made a statement. Baseball said loud and clear that it will not go quietly into the night. It will not be ignored. It was the running start that always fascinated me. Ichiro came to Seattle in 2001, the year after Kazuhiro Sasaki had won the AL Rookie of the Year and the Mariners had taken the New York Yankees to six games in the ALCS. If it were not for Arthur Rhodes’ chronic inability to get David Justice out, Seattle would have made the World Series that year. It remains the closest they’ve ever been to the Fall Classic. Ichiro arrived the year after A-Roid left. Rodriguez decided to take his talents and needles to Arlington, Texas. Since Randy had left in the middle of 1998 and Griffey had departed after the ’99 season, Rodriguez’s departure seemed like a death blow to the franchise. But it allowed them the money to afford the first Japanese position player in the history of major league baseball. He was a man who went by only his first name, like Elvis, like Pele. He was already a legend in Japan, but would his game translate to America? Opening Night, 2001, I’m sitting in the left field bleachers with my family. As someone who was taking Japanese in middle school (I was 13 at the time), Ichiro was the player I was there to see. My expectations for the Mariners as a whole were modest. I had no idea Bret “most likely juiced to the gills” Boone was about to unleash one of the great offensive seasons by a second baseman of all time and Paul Abbott (Who? Exactly.) was going to win 17 games (insert disclaimer about wins being a meaningless stat.) Boone, in fact, had a career total WAR of 3.1 over nine seasons. That’s terrible. In 2001, he posted a WAR of 9.3. To give you an idea of how insane that is, Jose Lopez, the man who replaced Boone after the *probable use of* steroids finally wore off, has a career WAR of 6.4 over eight seasons. So a lot of weird stuff happened in 2001 that allowed the Mariners to win 116 games and lose to choke against the Yankees in the ALCS. But Ichiro’s batting style was the weirdest thing I’d ever seen in the game of baseball. No one would teach their child to hit that way. You’re supposed to keep a solid base, weight back, etc. Ichiro did none of that. He was more a slap hitter in softball than a baseball player and I mean that as a sincere compliment. No one made a slow roller to short seem more dangerous than Ichiro. In fact in that Opening Night game against the Oakland A’s and their genius overrated GM Brad Pitt, Ichiro’s speed caused a late throwing error that cost Oakland dearly as the Mariners went on to win the first of 116. Lots of players are fast. But very few incorporate their speed into their hitting style. Ichiro knew that all he had to do was pound the ball into the ground and he could beat it out. In an era of juiced up sluggers and hitter friendly ballparks, Ichiro’s style was refreshing, to say the least. But what was amazing was that his teammates swore he could win the All Star Home Run Derby if he chose to participate. Yes, Ichiro, the master of the infield single, was legendary for the shows he would put on in batting practice. Ichiro’s power though is entirely to right field so in order to be a more complete player, he mastered the art of the single. Two batting titles, the all-time single season hit record, over 3000 career professional hits, his accomplishments at the plate are undeniably Hall of Fame worthy by themselves. But then you factor in the stolen bases and the defense and he rises to a whole different level. By at least one advanced metric, Ichiro is the 13th best defensive outfielder…ever. Now granted, defensive metrics are highly flawed (some bro named Paul Blair ranks ahead of him…who the hell is that?). But the eye test agrees with the metrics in Ichiro’s case, and then some. He introduced us to his spectacular defense with the throw (against Brad Pitt’s Oakland A’s no less) and didn’t stop wowing us for 10 years. Well, now he’s stopped wowing us. In fact, in 2011, he’s become a liability. At the age of 37, he finally failed to make the All Star team. He may not get to 200 hits for the first time in his career. And from a purely objective standpoint, his WAR in 2011 is -1. A replacement level player would be better than Ichiro. Even Chone “disgrace to the game of baseball and America” Figgins is having a “better” year (-0.5 WAR). This year though the haters have had a field day and for good reason. Perhaps a decade of losing (they haven’t made the playoffs since his “rookie” year) has finally worn him down. I just fail to understand how someone who was still so good at age 36 can all of a sudden be terrible at age 37. Normally declines are slower in the game of baseball. I hope this year is an anomaly. However, I think this is the end of the road for one of the most unique superstars the game of baseball has ever seen. It’s sad, but the man known for his running start…has crashed into a wall. Dreaming that you can do something implies that you aren’t really working towards it. I dream that I can play major league baseball but my goal in life is to become a major league baseball broadcaster. It’s a singular focus of mine that has been unrelenting since I was around 11 years old. For instance, at age 13 I auditioned for a show called “Kids Talk Sports” (I got the gig by the way) and the guy asked me if I wanted to be a broadcaster when I grew up. I responded that I didn’t want to be one…I was going to be one. As I grew older I realized that there are very few jobs in major league baseball for broadcasters. Also, everyone wants to be one. Becoming a major league announcer seemed more like a dream than ever before. Rick Rizzs is living that dream. He’s the voice of the Seattle Mariners. He also happens to be best friends with John Dittrich, the General Manager of the Joliet Slammers. I work as the Media Relations Coordinator and sometimes broadcaster for the Slammers and when they hired me John told me that he would introduce me to Rick. I talked to Rick on the phone back in March and that in itself was a thrill. But Monday, June 6 is a day I will never forget. I’ve been listening to the late Dave Niehaus and Rick all my life on the radio. Rick worked eight years in the minor leagues before being hired by the Mariners and this is the first season he’s been their number one voice with the passing of Niehaus. The Mariners opened a three game series with the White Sox on Monday and John arranged for me to go up to the press box and talk with Rick before the game. The trip didn’t start so well. The traffic from Joliet to Chicago was unbelievably brutal and I got stuck on the highway while they cleared an accident up ahead. Words not fit for the radio were flying out of my mouth as I sat in my car on I-55. Luckily I got to the game in the nick of time and after a bit of confusion how I actually was supposed to get up to the press box (apparently I needed a ticket even though Rick had left passes? ), I was there. Rick was not though. He had stepped out of the booth for a few minutes. So I exchanged some awkward conversation with producer/engineer Kevin Cremin. Kevin is sort of a legend in my mind because he’s been in the booth on Mariners’ broadcasts for years but you never hear him. He also has a really cool name. Rick arrived a few minutes later. He has a reputation for being one of the friendliest people you could ever meet and he more than lived up to that. When I mentioned that my favorite call of his was the Luis Sojo play in 1995…he repeated it verbatim. That was awesome. Rick also introduced me to Dave Valle, the color commentator for the game. He explained that Valle was a catcher for the Mariners back in the day (I knew this of course but I nodded politely). The number one piece of advice Rick has for aspiring broadcasters is to know the game inside and out. I could not agree more. If you don’t have a thorough understanding of the game and the team you are covering, you’re not going to make it no matter how good your voice is. He also emphasized that it’s important not to try and copy people. Find your own voice. It should be noted that I brought a friend with me to the booth who is not my girlfriend, but I’m pretty sure Rick thought she was. So it was quite amusing to hear him tell me three times to “always listen to her.” But that’s good advice nonetheless. Near the start of the game I made my move. I asked if he would give my demo CD a listen. He said absolutely, he would love to, so I gave him my demo CD with my business card inside the case as well. Rick reemphasized later as he was about to go on-air that he would definitely listen to it. I hope he has a lot of feedback (well I actually hope he thinks I’m the greatest broadcaster ever and I should be in the big leagues right now, but there I go dreaming…) because that would be quite the thrilling email. Getting feedback from a major league announcer is not something very many people get. The first inning started and Kevin gave me an extra headset so I could hear the call clearly. There was a crazy play in the bottom of the first where the M’s left fielder looked to have made an amazing catch up against the wall. But at the last second he dropped it. The White Sox runners became confused and at one point were both by second base. It was a crazy play and Rick was able to get through it like a pro. Watching him call it was hilarious because at the end he stood up and gestured to the field in excitement. I always like announcers who really get into the game because that’s my style as well, and that was a great moment. Rick had other guests scheduled to come to the booth during the game (did I mention he’s very popular?) so we only stayed for the pregame and the first inning. But it is something I will never forget. They say life happens while you’re waiting for the next big moment; well that was a big moment, and I’ll treasure it forever. The Mariners lost the game, but quite frankly I didn’t care. I think Chone Figgins did something stupid like getting picked off but I can’t be sure. To paraphrase “Casablanca,” I hope this is the beginning of a beautiful friendship. Maybe I’ll get to go back to the booth sometime in the future and stay longer. Maybe one day I’ll be the voice of the Mariners and live the dream Rick Rizzs is living. In case you weren’t aware from my Twitter and Facebook posts, I will be headed to Joliet in about a week to work in media relations and broadcasting for the expansion Slammers of the Frontier League. This is really exciting because I get to be with a team that was only formed a few months ago. What’s really amazing about this gig is that I wouldn’t have gotten it if Twitter didn’t exist. Sorry if this sounds like I’m rehashing what I wrote yesterday, but this is a new development. I am a member of STAA, which is a site that for about 20 bucks a month they’ll host your resume and demo and send you job notifications. They also have lots of other cool services that you can read about on their site. Anyways, one thing they did about a year ago was create a “Twitter list” of all their clients. They also created a list of their top 20 collegiate broadcasters of 2010. I happened to be on that list along with Adam Young, who is now the voice of Gateway Grizzlies of the Frontier League. Well Adam and I started conversing back and forth first on Twitter, then on Facebook. We critiqued each other’s demos and generally got to know each other via the world wide web. One day in December he emailed me about a potential opening with the expansion Slammers. I had never heard of the Slammers at that time but I sent the GM an email. He responded right away and invited me out to Joliet for an interview. At the interview I was really impressed with the organization, even though it’s in its infancy. The Slammers want to run their operation like a big league franchise and clearly have a great drive to be successful. They seemed to like me as well. For the next month I was basically sweating bullets waiting for a response and yesterday it arrived in my email. While I didn’t get the lead role, I will be heavily contributing to the broadcasts and handling most of the media relations for their inaugural season. This is awesome on so many levels, one of which is the fact I’ll only be an hour away from where I went to college and where so many good friends still reside. But the greatest thing is I’ll be getting paid to do something I love, which is everyone’s goal, isn’t it? This opportunity would have never arose without someone I’ve never met in person giving me the job lead. So stay tuned as I’ll be continue updating this blog on my journey to Joliet and through the 2011 baseball season. I’m a Mariners fan, so most would say I should not be excited about another baseball season. Considering my team scored the fewest runs in the DH era last year, that would be a reasonable statement. Also, when your biggest off-season acquisition was Jack Cust…well that says it all doesn’t it? But after this longest of winters, which has seen practically the entire country hit by multiple blizzards of epic proportions, the fact that Valentine’s Day marks the beginning of Spring Training this year seems very appropriate. It’s time to begin our love affair again. The baseball season is like an epic movie. It’s not for everyone. Some people have a hard time paying attention for that long. But for those who truly appreciate the beauty of what they’re seeing, it’s worth every minute. The thing about Spring Training is that it’s a time where every team believes there’s a chance this could be their year. I pay almost no attention to pre-season projections because they don’t matter. The lush history of baseball is full of improbable underdog stories of teams and players that no one believed in, rising to heights that no one could have anticipated. At the same time, sometimes teams suffer through seasons you wouldn’t wish on your worst enemy. Luckily for fans, this era of spectacular ballparks makes the suffering a little less harsh. The experience of going to a baseball game today is both tremendously fun and relaxing. Every football game is rife with intensity and you feel drained afterwards. That is fun, but my heart couldn’t handle that intensity for a whole year. Basketball games are indoors and intermittent, there is no rhyme or reason to the schedule; same with hockey. 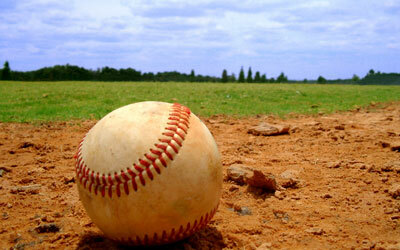 But baseball is every day (with a few Mondays off), and with a few exceptions, outdoors. Unlike football, you don’t have to stress over the result of the particular game you attend. At Safeco Field, when the Mariners are losing 10-2 to Detroit, I can still breathe in the fresh air and admire the surroundings. I can still appreciate the little things in the game, like a great throw from Ichiro, or a particularly nasty breaking ball. Baseball just relaxes me, yet is still wildly entertaining. It’s like there’s some sort of spell on the ballpark. Once I enter…all is right in the world. That’s not to say I don’t deeply care about the fortunes of my favorite team. 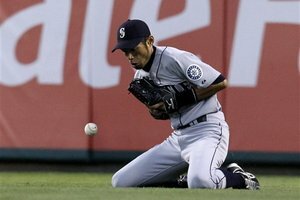 I think what’s happened over the past decade with the Mariners is tragic as we’ve wasted Ichiro’s career. One of the most exciting players of all-time has been to the post-season once due to poor management and bad luck. But Spring Training is here. There’s already positive news on the Eric Bedard front as he continues to try and revive a career that’s taken a turn for the worse. I’m excited to watch Adam Moore, Michael Saunders, and Franklin Gutierrez continue to develop. Dustin Ackley and Michael Pineda are close to Big League ready as well. Maybe new manager Eric Wedge will have an immediate impact. Maybe Chone Figgins will find himself and become the dynamic threat we thought we were getting last year. Maybe…just maybe…the Mariners can shock the world. It’s Spring Training time…I’m allowed to dream.